Modifier functions allow you to add formatting and apply evaluations to wildcards. For example, you can use formatting functions to format a list of values, convert a value to upper case or format a date. The evaluation functions are typically used when writing conditional statements within bindings. You can apply modifier functions to any wildcard. Most often, this is done within the Rich Text Editor. When you apply a modifier function to a wildcard the function 'wraps' the wildcard. Within the Rich Text Editor, highlight a wildcard. Click the wildcard modifier function button in the toolbar. Select a modifier function from the Wildcard Functions window. Click the playing card icon in the toolbar to open the wildcard window. 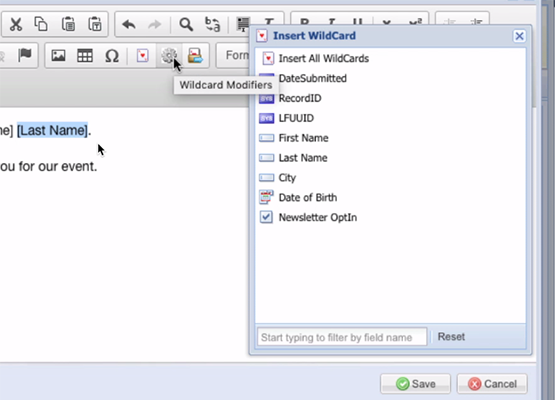 Right click the wildcard you want to format and insert and choose Apply Modifier Function & Insert. You will see the function (with parentheses) wrap around the wildcard. The Wildcard Modifier function library also contains evaluation functions (scroll down to the bottom of the Wildcard function window) which can be used in binding statements to create advanced conditional evaluations. See the topic Using Wildcard Modifier Functions in Evaluations for more information. Most of the functions are self-explanatory. As you hover over each function in the list, you'll see a tooltip which provides a brief explanation of the function.